For solving “how can I view my .pptx file on iPad” or “how can I upload .pptx file to YouTube” issues, converting PPTX to MP4 is the best solution. But how can we do that? If you have no idea, then follow this article to get 2 free methods of converting .pptx to .mp4 or .wmv file. What is the PPTX File and How to Solve PPTX Playback Issue? The PPTX file is a presentation file created by Microsoft PowerPoint or other presentation programs such as OpenOffice Impress or Apple Keynote. It contains a collection of slides, including text, images, formats, animations, drawn objects and other media. Ever since PPTX became the default presentation file format for PowerPoint 2007 and later, questions upon PPTX file playback have been flocking into various forums like “how to convert PPTX to MP4” or “how can I convert PPTX to video”. Yes, for playing PPTX file on our iPad or phone, or uploading PPTX file to YouTube, we all would like to convert PPTX file to MP4, FLV, etc. video formats. Next, follow this tutorial to get 2 common methods of converting PPTX to MP4 easily. Free HD Video Converter Factory enjoys a high rating among users. 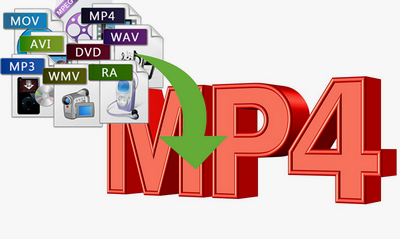 It allows users to convert any video to MP4 format, of course, if you want to convert video to AVI, MKV, MOV, etc. video formats, that’s available too. Try out this easy-to-use software now! If you use Microsoft PowerPoint often, you probably know that since MS PowerPoint 2010, Microsoft has added an additional feature - the "Create a Video" option. 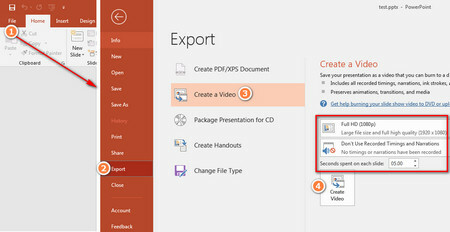 This new feature allows us to directly export and save PowerPoint as an MP4 or WMV format video. This means that just like converting PowerPoint 2007 to video or other PPT to video, we can open PPTX files directly on our computer and then use this new feature to convert PPTX file to MP4 without having to download third-party PPTX to MP4 conversion application. Step 1: Firstly, import .pptx file into PowerPoint and then move mouse to and click the "File" menu at the top-left corner. Step 2: On the drop-down menu panel, click the "Export" tab and then choose "Create a Video" option. Step 3: As you can see, here are two setup panels: 2 drop-down menus and slide duration settings. In the first drop-down menu, you can select the output video resolution and file size. In the second drop-down menu, you can choose to use recorded timings and narrations or not. After that, set the time value for seconds spent on each slide and click the "Create Video" button. Step 4: In the pop-up "Save As" interface, you can customize the name and path of the output video as well as determine the video as the output format of MP4 or WMV. Finally, click Save to complete the PPTX to MP4 or PPTX to WMV conversion. Sometimes, online video converters will become an alternative option for us because we don’t need to install software and its conversion speed is pretty fast. Next, let’s take https://video.online-convert.com/convert-to-mp4 as an example to show how to convert PPT to MP4 online. 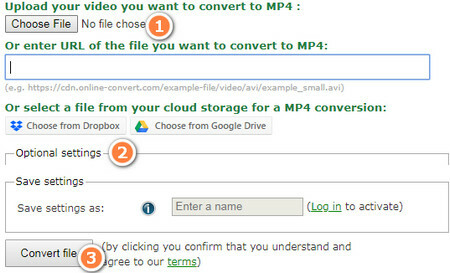 Step 1: For converting PPTX to MP4 online, firstly, please visit https://video.online-convert.com/convert-to-mp4. Step 2: Click Choose File and select your .pptx or .ppsx file for uploading. Step 3: (Optional) Here you can customize some video settings like change bitrate, frame rate or rotate video, etc. Step 4: Click on Convert file on the bottom. After a while, click on green Download button to download the video to your computer. These are the two most common free ways to convert PPTX to MP4, do you get them? After you've saved your presentation as a video, you can share it just as you would any other video. 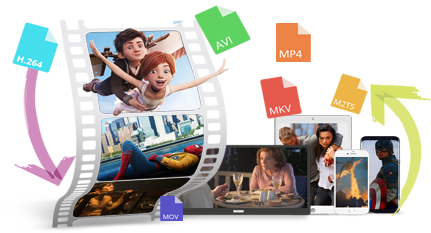 Free HD Video Converter Factory can convert video to MP4 with super-fast speed and with zero quality loss with just a few clicks. And then, you can watch any video on your portable devices at anytime anywhere. Free download it to have a try!